extending the life of the hydraulic system. 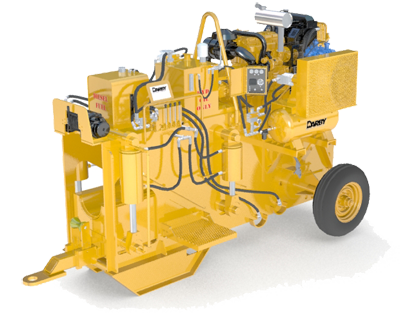 Parker four-section hydraulic control valve provides bending and winch operation. Hydraulic mandrel operation is a standard feature on all Darby bending machines. Maximum bending force at front of stiffback is 207,000 lbs (93,893 kg). Air compressor provides 240 psi (16.5 bar) mandrel operation. With engine running at 2,350 rpm, hydraulic vane pump produces 29 GPM (110 LPM) @ operating pressure.